This is a guest post by Krista Martin. That pressure to do more to be more and to learn everything about EVERYTHING that has to do with growing your business? I’ve been in the middle of a Strategy Session frenzy over here because it seems like it’s a germ or cold or virus that is going around. And we all know that isn’t a good – or a fun – place to be. You see, I want your business to be fun. And easy. And focused. I want you to know the difference between what you need to do and what is nice to do. The “nice to do’s” are, well, just that: they are nice. As the nice guy learned in dating, being “nice” doesn’t always get the girl. I’m not saying that I want you to be rude or to treat your business with disrespect. I’m saying quite the opposite: I want you to be respectful of yourself, of your goals, or your vision, and to be respectful to what matters most in your life. And I want you to spend your time, your most precious resource, in those places. I want you to get to work, have fun building your business, and then get on to the things that make building a business important to you. Maybe it’s spending more time with your family and friends. Or maybe it’s finally carving out the time to train for that triathlon. Maybe it’s jumping off of cliffs, swimming with sharks, and building schools in underdeveloped countries. And that’s what I want you to spend your time doing. I want you to spend your time LIVING in a way that feels completely authentic and wonderful and REAL to you. I want to live a big, spacious, amazing life. That’s why I want you to understand the importance of creating a plan for your business. Please don’t panic, I’m not suggesting that you grab your highlighter, your computer and pull up Excel and start making charts and graphs and all types of overly complicated things. No, nothing like that. I am suggesting that you create a tool that allows you to connect the dots between where you want to be and where you are now so that you know where and when to invest your time. I don’t want you to spend your time learning how to build a website or how to sell an information product or how to get your first membership set up if those things aren’t going to take you directly from where you are to where you want to be. The only way that you can know what is really worth your time and your money is to create a strategic business plan. I offered a One Page Strategic Plan-a-thon workshop last year and I’m actually offering it again right now (due to popular demand). So, if you know in your heart that this type of organization, simplicity, and focus will help you to mark this year as the YEAR that you made it big in your business and your life, please consider joining us. I’d love to help and support you. More details here . Your Core Values: This is the Foundation. What do you believe to be true and how do you want things to be? These are the building blocks for how you will build (and grow) your business and how you’ll make decisions. It is so vitally important to consider your values as your build your business because you want it to be built in a way that feels good to you and is authentic to you as a person. These are also the reasons that people will choose to do business with you. Your Big Vision. This has been said time and time again but I want you to ask yourself: how clearly can you articulate what your Big Vision is? Have you ever really written it down? WARNING: Do not get stuck in the “how”. Think big, bold, and way out in the future. Your Big Business Vision. You probably noted that “Your Big Vision” items may not directly align with your business activities. That’s OK. When you put together this part of your plan, please be sure to write it in the present tense. This part of the plan is where you consider how your business can give “Your Big Vision” items to you. Your Long Term and Short Term Goals. What do you want to accomplish in 5-7 years that aligns with your big vision? What do you want to accomplish in 3 years that aligns with your longer term goals AND your big vision? Break these down into two groups: one for your long term goals and one for your short term goals. What are the most important areas for you to spend your time and money to achieve your goals for 3 years down the line? What are the key areas for you to focus on so that you achieve your goals in 5-7 years? Choose 3-5 priorities in which you need to focus on (long term vs. short term) and clearly label them. Trackable Items: What are the things that you can track on a weekly (or daily) basis in your business to make sure that you are measuring your progress towards your short term goals? Make sure you that you track and measure your progress so that you can easily self-correct and make changes if you aren’t moving in the right direction. (Added bonus: this keeps you focused on the areas that you prioritized and that relate directly to your short term goals, long term goals, and your big vision). A strategic plan differs from a business plan in that you figure out where you want to be and then work backwards to where you are today. Planning your business based on where you want to be is an incredibly powerful way to create the clarity and focus that you need to build your business in a way that feels good, that serves you and allows you the time and space to live your life in a big way outside of your work. This year is going to be your year. I hope you know that. It’s going to be the year that you dream business becomes your reality if you invest a little time up front to get really clear on where you are going. Where you need to focus. And where you should invest your time and money. Krista is CEO & Founder of Make Your Mark (www.kristamartin.com). As a business strategist and client attraction coach, she partners with entrepreneurs to build their service based businesses to serve more clients, make more money, and have more fun. She has a MBA in marketing and is a CPCC (Certified Professional Co-Active Coach). In addition to working in the marketing and sales arena for more than 12 years, she built and sold her first “side biz” and now loves that she has the opportunity to partner with entrepreneurs that have so many great ideas but no clear plan of how to build their dream business. By putting together an action focused plan, she loves supporting clients to build a business that fits into their lifestyle instead of the other way around. She and her husband have two perfect (ha!) kids, ages 4 and 2, and an equally as perfect dog. Originally a native of the Midwest, she is glad to call Atlanta her home as she has much better access to the beach and ocean from there. Fantastic post, Krista! I totally agree: if you can’t fit something on one page, you’re wasting your time because you’ll never actually use it! Tracking weekly is also so important! Such great tips. Lisa I agree too! One page is enough! Yes! Thank you Krista. Why do we always try to complicate things? You’ve made me see that it really can be as simple as having a map to show me the way and being consistent about doing the things I need to to get me closer to my goals. Consistent – a big word for me in 2014! Krista ~ Everything you wrote is on point. 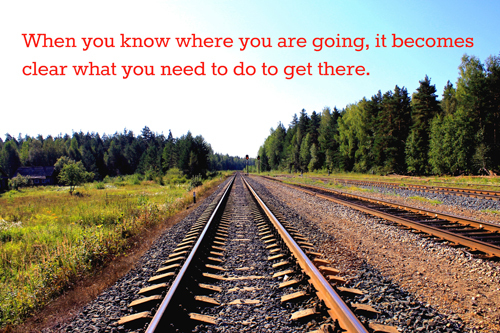 As business owners it’s so important for us to know where the end goal is and work backwards. I love how easy and understandable your action steps were ! Tamsen TRUTH! That is something I always need to remind myself of, I can easily get caught working in the wrong direction. Succinct – that’s what I use Twitter for! Succinct isn’t my strong point. 🙂 Reminders like this help! Yes, Lacy, perfect analogy! We tend to overcomplicate things so much that we can’t see the answers that we’re looking for…even when they are right in front of us. Thanks for your comment! Thanks Tamsen. BTW, I love your name. It’s so pretty and unique. As long as you can see it, you can create it! Thank you for your comments. Nice to “meet” you. Great post Krista! I love how you break this down into such manageable chunks. Definitely something we should all do to stay focused and clear. Thanks! Lorna, thank you. It’s so easy to get overwhelmed that I feel like we have to make a conscious effort to UNDERwhelm ourselves. Glad you found it helpful! Simplicity! Over-complicating things is often our ego trying to trip us up from getting clarity, getting strategic, and taking those small steps every day toward that big vision. Thank you Krista and Karen for sharing this! Sabrina – you are right on! That darn ego…. 🙂 Thanks for your comment! Wonderful article Krista!! It’s so clear and actionable. Thanks for the reminder to keep things focused and fun.